If I haven’t said so lately… Democratic Sen. Patrick Leahy is an unmitigated moron. He was ill-equipped to dance with Gorsuch at the hearings today. He tried to pin him down on President Trump’s refugee freeze, which Leahy kept branding as a Muslim ban. Gorsuch deftly parried Leahy’s jabs. He flatly said he would not rule on any case in a hearing no matter what… it is a pending matter and he flatly refused to comment on it. Good for him. A man of principles and ethics… Scalia would be proud. Gorsuch is a constitutional originalist. He is for religious liberty and will steadfastly apply the law. And dig this… two Democrats told Judge Neil Gorsuch at his confirmation hearing on Monday that it’s not a good thing for a Supreme Court Justice to interpret the Constitution based on the Founders’ original intent: “In contrast to past nominees like John Roberts, whose judicial philosophy was not clearly articulated when he appeared before this committee, Judge Gorsuch appears to have a comprehensive originalist philosophy, the approach taken by jurors such as Justice Scalia, Justice Thomas, former Judge Bork,” Sen. Patrick Leahy (D-VT) said in his opening statement. “While it has gained some popularity within conservative circles, originalism, I believe, remains outside the mainstream of moderate constitutional jurisprudence.” Leahy is anti-Constitution and anti-Founding Principles. He is a Marxist and this statement does not surprise me in the least. Democratic Sen. Patrick Leahy struggled to pin down Judge Neil Gorsuch Tuesday on President Trump’s controversial travel ban, as the Supreme Court nominee smoothly sidestepped questions relating to the policy currently on hold by the courts. 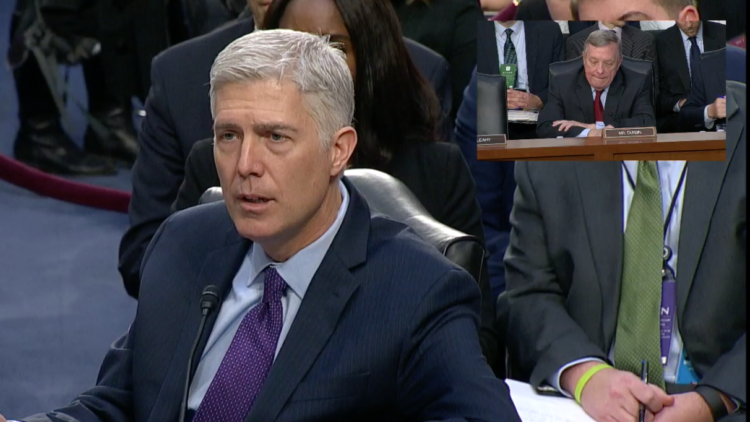 Gorsuch instead directed the contentious cross-examination into more general terrain where Gorsuch could advocate for religious liberty, without commenting on the specifics of the case. “I will apply the law,” Gorsuch vowed, during the second day of his Senate confirmation hearing. Leahy initially had tried to get the 10th Circuit Court judge to comment on the notion of a “religious litmus test for entry into the United States,” in apparent reference to Trump’s attempt to suspend immigration and travel from six mostly Muslim countries and the refugee program. Gorsuch parried, refusing to discuss issues that could come before a court he sits on. “Would the president have the authority to ban all Jews from America? Or all people that come from Israel? Would that be an easy question?” Leahy asked. Gorsuch ended off by flatly telling Leahy that no man is above the law. And that is how it was meant to be. Someone should remind our leaders that it should have applied to Barack Obama as well, not just President Trump. Gorsuch destroyed Leahy here… another liberal bites the legal dust. I feel a nuclear option coming on.